Hi guys, today we are going to teach you how to model a bus admittance matrix (Y-bus) of a given power system. Modeling and solving of Y-bus matrices is an important part of Power system analysis and design, and is used extensively in diagnosing, solving and finding problems in power systems especially different kind of faults. But before you do any of that stuff you first must know how to make a Y-Bus matrix (short form for Admittance, often denoted in electrical equations as Y, inverse of impedance Z) of a given power system, involving grids, transmission lines transformers and loads. Next we will teach you how to solve a Y- Bus matrix. Y11 means all admittance connected at node or bus no 1. But in the figure we are given values in impedances, so will convert them to admittances first and then add them. 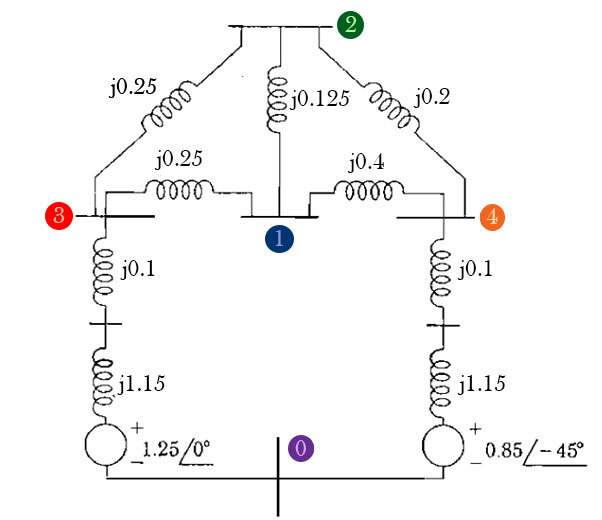 As you can see bus no 1 has impedances j0.25 (Z13, impedance between bus 1 and 3), j0.125 (Z12) and j0.4 (Z14) connected to it, we will individually convert them to admittances and then add them that will be the value of Y11. Remember you will first have to see the figure that which admittances are connected to the given bus. In the same manner you will have to calculate Y22 (some of all admittances connected at bus 2), Y33 and Y44, this deal with diagonal entries of Y-bus matrix. Entries Y43,bus and Y32, Bus are 0 because there is no link between these two busses. To calculate missing bus voltages or current, for power rid analysis or for fault analysis. Keep visiting Real Engineer for more engineering tutorials.